A new listing for fall 2018, this Stratton Mountain Townhouse at Intervale is all about location and convenience. Our mission is to make your stay comfortable and memorable. The property boasts 2 master bedroom suites with en-suite bathrooms, a bedroom with 2 twin beds, and a bunk room perfect for sleeping 4. 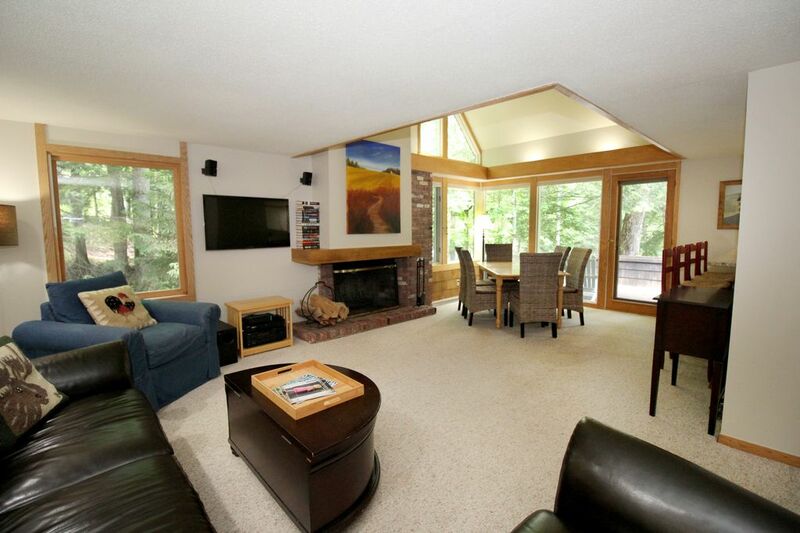 An open layout with a wood burning fireplace as its focal point is perfect for relaxing after a long day on the slopes! Enjoy the fully equipped renovated kitchen with breakfast bar and 4 bar stools, in-unit full size laundry, WiFi and cable, entryway ski storage and firewood already stacked at your door when you arrive. Our location is just minutes to the base of Stratton Mountain and Stratton Golf Resort. You are welcome to use the free shuttle service provided by Intervale to bring you slope-side. No parking necessary! Whether you are visiting us for our world class skiing and winter sports, spectacular fall foliage, or amazing summers, there are countless activities, shopping and restaurants on and around the mountain for the entire family to enjoy. The Paterna's and Greene's are long time friends. Courtney, Ali and Dave met at Syracuse University in the late 1990's. Ali and Dave got married after they graduated and Courtney met her husband Matthew a few years later. Courtney and Matthew live in Milford CT with their 2 children Madelyn and Miles, 2 dogs Yogi and Munson (yes we are Yankee fans) and 2 cats Button and Morrison. They have been Vermont regulars for many years as Courtney's family has owned property in Londonderry since 1965. Ali and Dave are a fun loving couple who love traveling, music and art. They love spending time in Vermont, so it was an easy match for the family's to work together. Aside from our great location, we have everything you need for a comfortable and memorable stay in the Stratton mountain area. I love this place because you are surrounded by big pine trees that gives you the feeling that you're in Vermont. No matter what time of year, it's just beautiful here! Sometimes vacation rentals can be cluttered and outdated. NOT THIS ONE! We recently acquired this property in Summer 2018. Our goal was to create an "at-home" experience. We want all of our guests to feel at-home in our place. You will note that the unit is clean, organized and comfortable. It sure doesn't hurt to be 3 minutes from the chair lift and 2 minutes from the first tee. If you're hungry you can hit 20+ great restaurants less than 10 minutes away. Dining table has 6 seats. There is additional seating at the breakfast bar with 4 bar stools. Two Smart TV's - one in the Living Room and one in the Bunk Room. Both can access your streaming services. Perfect place to stay. Spotless clean. Comfortable like home. Will totally rent from them again. Stratton Mountain boasts a long list of events and activities for all ages. Stratton Golf resort, with picturesque mountain views, is 2 minutes from the unit and offers the Stratton Golf School, founded by Arnold Palmer. There is no shortage of great ponds, lakes and rivers for your family to swim, boat or simply relax. Hiking and mountain biking are 3 minutes away on the mountain. Or take a gondola ride to the top of the mountain and enjoy the amazing views Stratton has to offer. Bromley Mountain, only 12 minutes away, boasts the largest alpine slide in Vermont along with other fun rides, games, ropes course, zip lining and more. Don't forget about the leaves. As autumn arrives, Stratton is always one of the best places to see the foliage change in New England. Weekend festivals and beautiful color displays are abound. This is the best time of year for a hike or bike ride. You'll just have to see for yourself. Stratton Mountain is considered to be the premier ski destination in southern Vermont. Stratton was recently purchased by Alterra Mountain company, a large multi mountain company that plans on investing millions. Be sure to book your weekend early as winter dates always fill up the quickest!